Today’s guest post is courtesy of Anna M. Harte; prolific writer, voracious reader and one third of the team that is Ergofiction. Anna is here to talk about the process of making the Other Sides anthology, from conception to publication. Like most weird and wonderful things, it all started during a late night conversation on Google talk. Well, late night in London, and dinnertime in Monitor City, where my trusty sidekick and technician MCM lives. A brief background on our relationship: MCM dreams up monumentally unconvincing ideas which have little bearing on reality. I pull out a whip and make them happen. 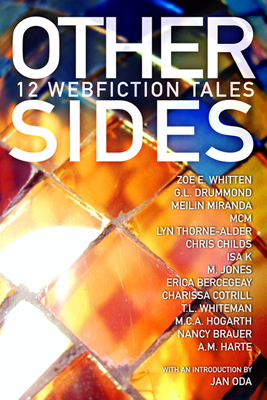 Such was the case for Other Sides, a short story anthology which celebrates the internet as a platform for storytelling by offering the average reader a sampler of quality online fiction. MCM has already written an excellent post on Novelr covering the conception of and intention behind Other Sides, so I’m going to focus on my part of the process: the whip-cracking. Balls on a trampoline, alligator wrestling and forgetting your keys: Marcus Chown has the answers. A while ago I offered readers the chance to ask tricky questions of cosmologist and author Marcus Chown. The questions were exactly what I would expect of my astute and intelligent readership. Read on to find out what Marcus has to say in response. OK. Marcus, we hear from scientists so often that “you’d have to know maths to be really able to understand the theory”. Frankly, this always seems a bit feeble. Maths is just a way of expressing reasoning. I suspect what it actually means is that many scientists are not actually able to explain the concepts they deal with but are content to leave this mystery at the heart of what they do and ‘merely’ manipulate the ideas mathematically, almost mechanically. Do you feel there is any truth in this? Marcus Chown, author of We Need To Talk About Kelvin (which I have just reviewed) has very foolishly kindly agreed to field questions from you, my blog readers, to be answered in a special post next week. I’d be very happy to answer questions from your readers on anything – science, the universe, writing etc. (Can’t guarantee a sensible answer, though!). So have at it! Post your question in the comments (with a name, please) and I will forward them on to Marcus. Next week, drop by for the answers. The comment trail will remain open for questions until Sunday night. Juliet Maruru is a writer living in Kenya. She manages the web presence of Story Moja Africa, a new publisher, and is an advocate for women’s rights, as well as building her writing career. And she does all this while battling the debilitating chronic disease Lupus. Kenya, for the geographically challenged, is a country on the east coast of Africa, right on the equator, in the same region as Somalia and Ethiopia. As late as 1957, Kenya was still a British colony, and it has had a turbulent political history both pre- and post-colonialism. I’m delighted to welcome Juliet to the blog. Readers, grab a cup of tea and pull up a chair, and get to know Juliet Maruru. MF: Hi Juliet, and welcome to the blog! First off, can you tell us when and why you decided to write? JM: I started writing when I was about 10, with a bit of encouragement from my stepfather. I did not really take much interest in it, except for the occasional stories I wrote and then hid. When I was 13/14, I was going through a difficult emotional period after being sexually assaulted by a family friend. I went into psychological therapy, and my therapist encouraged me to write, more for myself than for anyone else.